This is the home of the authentic Hug-A-Dog Harness. Welcome! This year marks our 27th year in business! We were the first to create a dachshund-centered business (starting in the days when “cut & paste” literally meant to Cut & Paste on paper) and we were the first with an online-presence (when Amazon and eBay were in their infancy). Our business has come a long way in 27 years, both offline & online..
We specialize in products for the hard-to-fit dachshund, including the very popular Hug-A-Dog Harness®. Our harnesses, coats, sweaters, beds, & carry bags are all handcrafted in Northeast Ohio. Each item is made with care, as if we were making it for our very own dogs. We stand by our quality and workmanship. Besides our custom-made products, we also carry some dachshund-themed gifts & accessories, and some awesome t-shirts with exclusive designs. 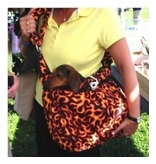 Our products are designed for dachshunds, however, we do make them for other breeds. Many owners of hard-to-fit breeds come to us for custom-fit harnesses and coats. 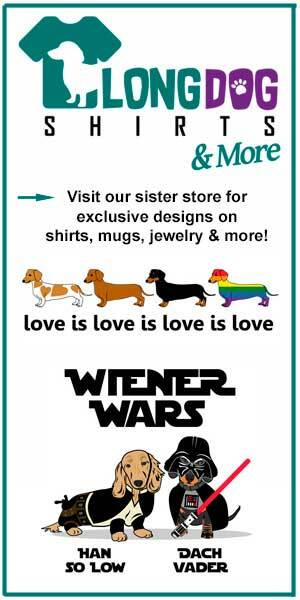 So if you are a dachshund lover, you’re in the right place! If you don’t have a dachshund, that’s OK! Have a look around – we can most likely create something for your special dog!